Last year, Kino Lorber released the blu-ray boxset The Films of Joaquim Pedro de Andrade. The collection features the restored versions of every film made by the great Brazilian director better-known for the classic Macunaíma (1969), as well as an essay by me. On Wednesday, one of his very best films, The Priest and the Girl (1965), will be screened at Michelson Theater, in the Cinema Studies department at NYU. 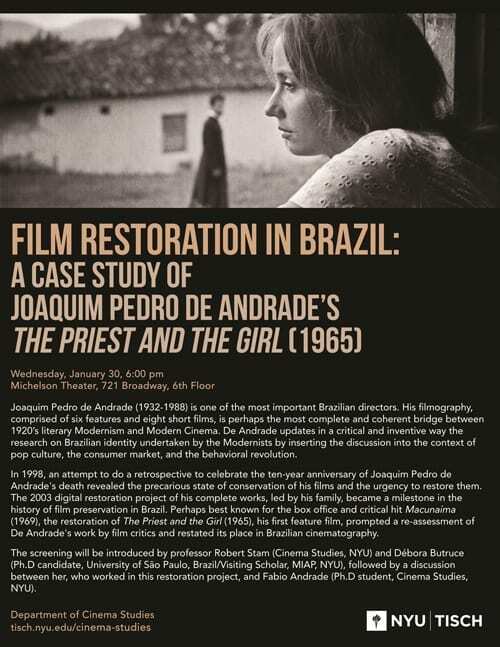 Before the screening, there will be introductions by Robert Stam and Debora Botruce, a visiting scholar from the University of São Paulo (USP) who worked on the restoration of the film. After the screening, Debora and I will talk a bit about the restoration process of this enchanting film. The screening is free and open to all. As a belated celebration for this extraordinary release, I will be posting a few shorter pieces about Andrade’s films here.